GFX works with change-makers from around the world. Here you will find our incredible events and activations to inspire you. We're thrilled to be swapping in NYC at the SoHo Grand hotel with our friends from Fashion Revolution! GFX get's glam with DJ NIKS on the decks, Céline Semaan from The Library, chic shopping with exclusive items by Faubourg, and celebrating the official release of The Regeneration Magazine Fashion Issue with Kyle Calian and edited by GFX Founder, Patrick Duffy! This event is FREE and open to everyone but pleases read the rules of the game to make sure you get the goods! PLEASE REGISTER VIA EVENT BRITE HERE! BRUNCH + MUSIC +DANCING ALL DAY: Call (212) 965-3000 for more info and reservations! STEP ONE: Check in with GFX team at the specified time and location. We encourage you to bring as many items as you like, garments and accessories are quality screened to ensure a quality experience. Each item that that passes a screening, you will receive a token/ticket in exchange. If your items are not suitable for swapping you can either take them back or leave with us to recycle. The tickets/tokens are your currency for the swap. As the swap is 1-to-1, you will use these to check out after you have made your selections. STEP 2: After check-in, the team takes your garments and sets up the swap area. When the swap area is ready there will be a brief introduction to the swap and the ‘rules of engagement’ to remind people of our policies. STEP 3: Start your engines! Swappers enter the ‘shop’ at the specified times and may begin perusing. While swapping, we limit the number of items you can hold at one to avoid any unnecessary hoarding! If you have three items, try them on, and if you want to keep an item – take it off the hanger and carry it that way to signal that you'll be keeping the item. Once you have completed your selection, you can hang out in the swap area as they tend to be really fun or check out by taking your new items back to the entrance and show your tickets/tokens to the staff to claim your new clothes! Come celebrate Fashion Revolution Week with ONEBYME in partnership with Global Fashion Exchange x Fashion Revolution for ONE special night! Get your Saturday night started with GFX + Fashion Revolution + ONE BY ME in Whitechapel! A night filled with signature ONE BY ME cocktails (virgin available), munchies, live music and a clothes swap, if you so desire. All to celebrate the "Birth of a New Movement"! It is a momentous occasion for the Sustainable Fashion Industry. The world's first ONEBYME ONELAB is opening soon! OBM will be moving out of the old studio in Whitechapel and into our new premises in Poplar to open our first ONELAB.To mark this significant occasion, we want to entertain you in our old studio in Whitechapel, ONE last time. Grab your Early Bird Tickets for £4.50. Tickets at the Door will be £10, so secure your Early Bird Tickets today! All funds collected will be passed onto the talented musicians playing on the night. So let's support our Emerging Musicians together! GFX and Fashion Revolution are excited to announce the first-ever, GFXxFashionRevolution Global Swap Events! The goal is to swap 1 Million lbs. (500,000 Kilos) of clothing globally during Fashion Revolution Week 2018. The Fashion Revolution Miami team invites you to be part of this worldwide event and do your part. Quickie Couture, easy alterations for your beloved clothes , frugally refresh your closet, learn to style using second hand clothes, or make your own necklace from scraps. 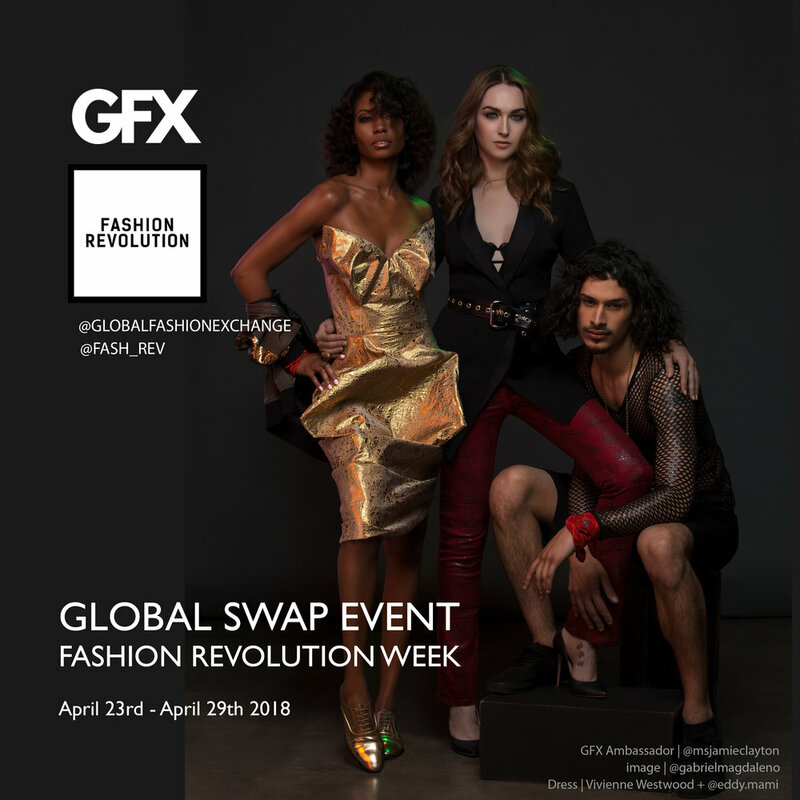 Fashion Revolution and GFX are excited to announce the first-ever, GFXxFashionRevolution Global Swap Events! We're teaming up with a global goal of swapping 1 Million lbs. (500,000 Kilos) of clothing during Fashion Revolution Week 2018! Honoring the 5 year anniversary of the Rana Plaza tragedy, together with we aim to give textiles a new life by empowering consumers to take action for a better environment while they stylishly renew their wardrobe. Download the guide on how to host an event and plan your swap (link here) and be a part of the largest #globalfashionexchange ever! GLOBAL FASHION EXCHANGE is partnered FASHION REVOLUTION for the GLOBAL SWAP EVENT. The Dubai edition of GFX is taking place at RETOLD - Dubai's only boutique for inclusive pre-owned fashion! We want YOU to be part of the FASHION REVOLUTION! Let's work together this Fashion Revolution Week to close the loop on fashion - join us for the GFXDXB clothes swap. Find near-new, stylish items in your closet that you’re ready to part with. Please make sure they are in good condition (not stained or damaged), and clean (washed or dry cleaned). Max 10 items can be swapped; anything extra will be donated. Purchase your ticket on Eventbrite. The nominal ticket price goes towards covering the cost of the event - please invite your friends to be part of the revolution too - this is how revolutions gain serious momentum! Drop off your items to be swapped at RETOLD any time BEFORE April 20th, the boutique's opening hours are 8am - 8pm. Please make sure you let the RETOLD team know you are delivering your items to be swapped, and show them your Eventbrite ticket. Visit the boutique any time during Fashion Revolution Week to select your new pieces from the SWAP RAILS. GFX is a GFX is a 1-to-1 swap - there are 2 categories: High Street and High End. If you bring 6 items, you can take 6. If you bring 2 High Street and 4 High End then you can select 2 High Street items and 4 High End items. Use all the social media tags and handles to spread awareness! We will have both Women's and Men's sections! GFX MISSION: To SAVE a million pounds of clothes from being discarded by giving them a second life. GLOBAL FASHION EXCHANGE (GFX) is an international platform promoting sustainability in the fashion industry with inspiring forums, educational content and cultural events. Through interactive clothing swaps GFX empowers consumers to take action for a better environment while they stylishly renew their wardrobe and save hundreds of thousands of clothes from going to landfill. FASHION REVOLUTION WEEK is a global movement calling for greater transparency, sustainability and ethics in the fashion industry. The aim is to unite the fashion industry and ignite a revolution to radically change the way our clothes are sourced, produced and purchased, so that what the world wears has been made in a safe, clean and fair way. Fashion Revolution Week is from April 23-29th and falls on the on the anniversary of the Rana Plaza factory collapse, which killed 1138 people and injured many more on 24th April 2013. Global Fashion Exchange is proud to partner with an exclusive Australian first for an industry-only event, focussed on responsible fashion practice and supporting economic growth on March 22nd in Sydney, Australia! Were excited to bring together the sharpest minds in responsible fashion, to help Australia's largest fashion retail companies develop responsible practice and to build a stronger local industry. Global Fashion Exchange lands in Melbourne and partners with The Clothing Exchange and Fashion Revolution to create the cities largest and most exciting ethical fashion event for VAMFF 2018. How to participate: Bring up to 6 items that are seasonally appropriate, clean, pressed and free from major fault to swap on the day! GFX Talks travels to Melbourne! Learning about the industry and its challenges from the unique perspectives of our experts, GFX Talks will explore the vision of each and how we can collaborate to create a positive impact for a positve fashion future. Join us for a boutique swap experience in the heart of Los Angeles at the brand new FF-1051 Gallery. Hosted by Global Fashion Exchange in partnership with Bead & Reel, we're showing a chic new side of pre-loved fashion. Bring your best clean, gently-used clothes, shoes, bags, jewelry, and accessories that you would love to give to a friend, and exchange them for fresh, beautiful styles for yourself! The average American tosses 82 pounds of textile waste each year, which adds up to 11 million tons of trash in landfills annually. Fight fashion waste and get set for the holidays with this exclusive swapping event. For every item you bring, you can take something else home! Fashion Exchange's landfill savings (40,000 pounds and counting!). Anything left over will be donated to the Downtown Women's Center or recycled with I:CO, so nothing goes to waste! NO fast fashion brands (example: Forever 21, H&M, Zara, etc.). If you're unsure if a brand is acceptable, email us at hello@beadandreel.com for clarification. All items must be clean, lightly used, and something someone else would actually want to wear. Street parking can be a little tricky in this part of town so we recommend leaving extra time to find a spot. Carpooling and ridesharing are always great options too! Refunds can be requested up to 24 hours in advance. After that tickets are non-refundable. You must be on our guest list to attend this event. If you want to transfer your ticket to someone else, you must contact us up to 24 hours in advance with the name and email address of the new guest. It is a pleasure to invite you to the United Nations for an important DPI NGO Briefing led by GFX founder Patrick Duffy. The purpose of this talk will be to inspire thought and provide solutions on how to ignite positive change in the fashion industry and the world beyond. The discussion focuses on using fashion a vehicle to create positive change followed by a showcase featuring ethical designs from around the world. We hope you can join us! Press and other inquiries please email me directly. As this is a movement we are creating, please do forward this to other like minds who you think would like to attend. We look forward to changing the world with you! + have drink & enjoy a collection of best videos about textile waste reduction. A MINIMUM of 3 ITEMS IS REQUIRED. • In good condition and clean. • Dropped at the boutique between 11.AM and 5.PM before October 20th. ADMISSION : 4$ (In order to support our women empowerment projects locally and internationally). + prenez un verre avec nous et profitez de notre collection de vidéos sur la réduction des déchets textile. UN MINIMUM de 3 PIÈCES EST REQUIS. • En bon état et lavées. • Déposées dans nos locaux entre 9h et 17h avant le 20 octobre. ENTRÉE : 4$ (Cette contribution servira à soutenir nos projets visant l’autonomisation des femmes d’ici et à l’international). Evènement organisé dans le cadre de la semaine québécoise de réduction des déchets. We are so excited to launch our partnership with FASHION TAKES ACTION As we take a big first step across the border we launch with "Swap & Social" and over the next year will be bringing you many more exiting and engaging events with FASHION TAKES ACTION across Canada! Surely there are items in your closet you’re ready to let go of. Why not add some new pieces to your wardrobe without breaking the bank! Looking to start shopping sustainably but don’t know how? Well then you're in luck! Join us Friday September 22nd for our SWAP & SOCIAL! Swap your unwanted items with our community, mingle with like-minded people and have a beverage or two!! The Global Fashion Exchange takes place at ModaLisboa – Lisboa Fashion Week, at CCB (Centro Cultural de Belém), on March 11 and 12, in a space that includes several activities: A swap market, a lounge, Dj's, workshops, networking events and artistic installations. At the swap, which will take place on Sunday, March 12, from 5:00 p.m. to 7:30 p.m., the public will be able to exchange pieces that they no longer use, renewing their wardrobes for free, experimenting a sustainable and innovative way of consumption while avoiding textile waste. Press and Ambassadors preview at 4.30 pm. To access the swap guests must bring at least one item of gently used clothing from their own wardrobe. After the swap we will close the loop by sending the leftover clothes to our partner I:CO, which will recycle them into new products, textiles and housing materials. The Global Fashion Exchange (GFX) was founded in 2013, where it took place for the first time during Copenhagen Fashion Week. It has since grown into an international platform promoting sustainability in the fashion industry through inspiring forums, educational content and cultural events. Hosting clothing swaps in global cities like New York, Los Angeles and Melbourne. So far, the GFX swaps have saved 19 tons of waste from going to landfills. GFX has also been recognized by the United Nations, participating in talks surrounding their 70th anniversary. 5.30 – 9.30 pm: GFX Art & Fashion Experience: Ateliers, workshops and artistic installations. Takeover Rádio Quântica DJs: March 11th and 12th. 8:15-8:30 Market break. Several NGO's and non-profits will feature their work. Accessories and other products available for sale. Enterprising New Yorkers turn to FIT for practical know-how and support to build successful businesses and to upgrade the technical skills indispensable in today's business and design environments. For over two decades Enterprise Studies & DIgital Design has served those at the intersection of art and commerce with credit and non-credit classes, conferences, round table discussions and other special programs.